Vegan plum upside-down cake...vegan mocha cake...there's a lot going on with this single layer of deliciousness. This was the product of visiting home on the day of my sister's birthday, raiding our fridge and cupboards to pool together ingredients that would result in a slightly unconventional cake. My sister loves chocolate, but I didn't want to make another run of the mill fudge/brownie number. 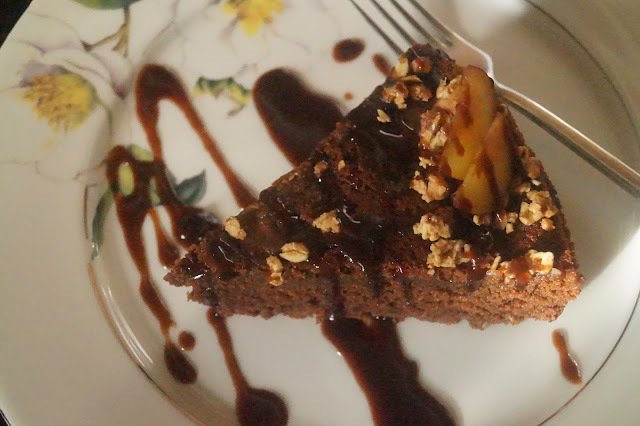 This plum upside-down mocha (chocolate & coffee) cake, with a mocha-flavoured caramel sauce, hits all the same spots that a decadent chocolate cake would, but it's also more grown up in its flavour profile and has a lot more depth, reflecting (she says poetically) the very real, bitter-sweet awareness that my little sister is no longer a kid *sob*. To make the cake, sift the flour into a large mixing bowl and add the cocoa powder and brown sugar. In a separate bowl, add the black coffee, coconut milk, sunflower oil, vanilla extract, and rum/brandy (optional) and whisk together. Add the wet ingredients to the dry ingredients and fold gently, being careful not to over mix. Line the base of a round springform cake tin with a round piece of baking paper. Grease the sides of the tin with a little sunflower oil. Core the plums, discarding the seeds in the middle, and slice into rings. Arrange the plum rings onto the base of the cake tin, fitting as much or as little of it as you desire. Pour the cake batter over the plums. Bake in a pre-heated oven, 170C, for 25 minutes. To check that the cake is cooked at the centre, stick a skewer in the centre and make sure it comes out clean. Allow the cake to cool before taking it out of the tin, turning it upside down and peeling back the baking paper to reveal the plum design. To make the mocha caramel sauce, place all the sauce ingredients in a saucepan and bring to a boil. Stir occasionally and keep an eye to make sure that it doesn't burn, but essentially you want to boil it until the sauce starts to reduce down and thicken. This should take approximately 15-20 minutes. You'll know it's ready when the sauce coats the back of a spoon when you dip it in and out. Yayy so i finally got another recipe of mocha cake. The mocha caramel sauce recipe is amazing and the idea of topping it with coconut ice cream is just perfect.